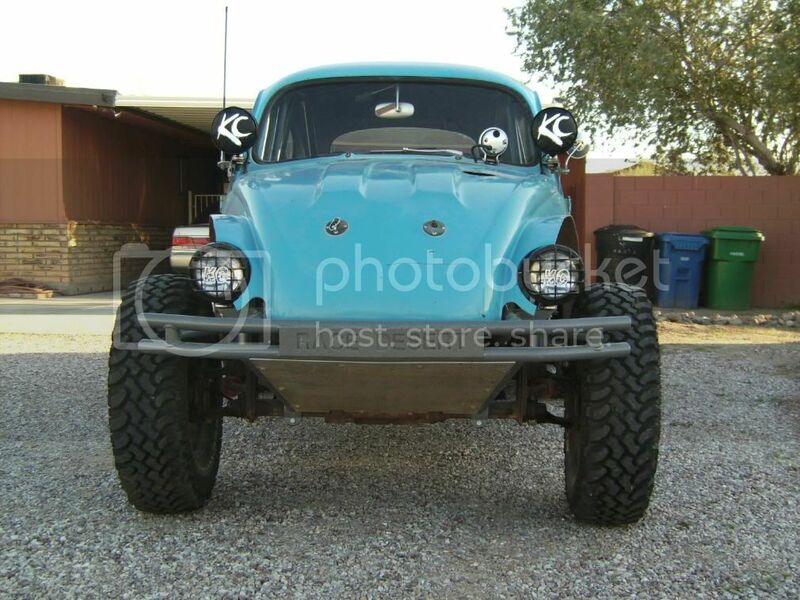 AzBaja.com, Home of the VW Baja Bug -:- Baja Forums -:- VW Volkswagen Bug, Baja, Bus, Sandrail and Thing -:- VW Volkswagen & Baja Bug General Discussion -:- mounting lights with a one piece front end??? 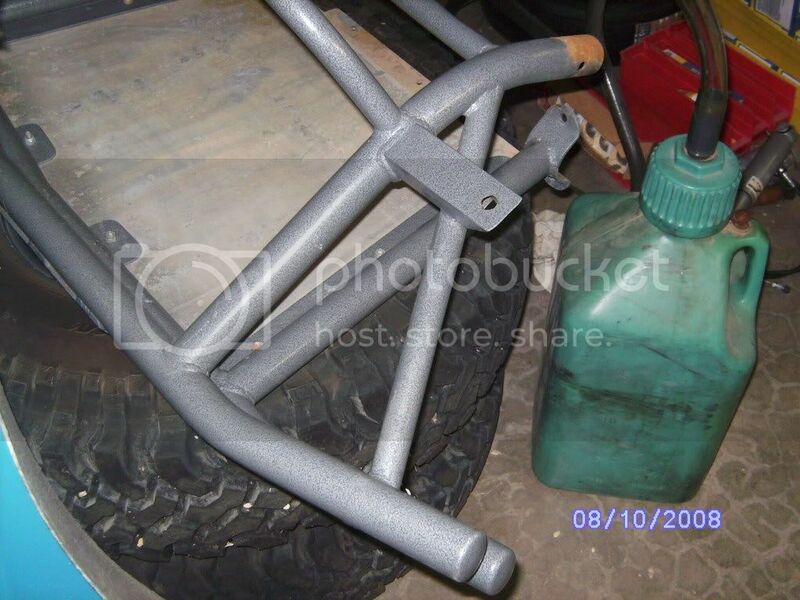 Baja Forums -:- VW Volkswagen Bug, Baja, Bus, Sandrail and Thing -:- VW Volkswagen & Baja Bug General Discussion -:- mounting lights with a one piece front end??? mounting lights with a one piece front end??? Post subject: mounting lights with a one piece front end??? what kind of lights do i purchase for the one piece front end i want them to be behind the front clip not mounted on it. Post subject: Re: mounting lights with a one piece front end??? I think you'll have to fab up some mounting brackets for them that come off of your cage or front end support. I believe there are off-road style lights that are self-contained units and are high/lo beam. Try Chirco. how did you mount yours az? I use some old style buggie lights (KC Lights Buckets with High/Low) that sit on some tabs welded to the cage. The lights sit behind the hood in the light hole area. Also my lights are not the full size 7" monsters but the smaller size for the clasic 4 head light set up 4"/5" I think. Well, here's what mine look like from the front. Then, here's what the brackets coming off of the front bumper assembly look like dismantled. 'Fraid not, man. Most everything on this car is wayyyyyyy beyond the scope of my abilities! For what it's worth though, that bracket you see is square tubing that has the end cut at a 45* angle so you can access the bottom of the light for mounting. I'm running stock (sort of) headlights in buckets run off of the shock towers. I welded 1" tubing from the towers to the area where they fit best to the openings in the 1pc. ft end, and gussetted the mounts so they won't vibrate. I personally prefer stock style headlights, as they illuminate the signs on the road best with the pattern they throw, and they have the high beam/low beam option. Run additional lights for off-road use. Shock tower mounting works for 7 piece body too. Hey 57! Where'd you hide the fuel tank!? You got one of those "no smoking please" decals on the passenger window (as in backseat tank) ?